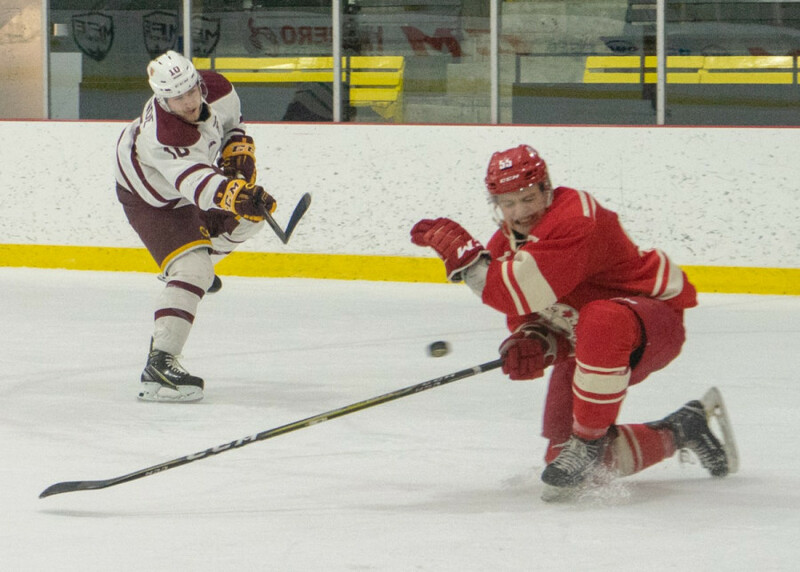 If newly acquired defenceman Simon Bourque was watching his new team against the Royal Military College, they certainly gave him a comeback worth seeing. His future rookie teammates in particular showed off a young core of players ready to make an impact. Stingers Jake Fletcher and Charlie Roy put up standout performances in a game that seemed almost out of reach after the first period. Concordia found itself down 3-1 to a team looking up at them in the standings after 20 minutes of play. It was a period filled with “stupid mistakes” according to head coach Marc-André Élement. The only bit of hope for the Stingers in the first period came out of Roy’s first career U Sports goal: a shot from the bottom of the circle with the goalie sprawled across the crease. Roy’s strength has been more in his defensive game than his offensive side so far in his rookie season (though he earned powerplay time against RMC). After his goal, he showed just why his coaches like the rookie’s game so much. Roy played an integral role in shutting down RMC’s offense, holding them without a goal in the second and third periods. “He’s playing well under pressure and when he has a lot of ice time […] we’re really happy about his game,” said Élement. Roy’s captain Phil Hudon called the rookie’s game comfortable and smooth rolling. An apt description for the quiet but forceful presence he had on the blueline as well as the team’s transition game all night, playing with multiple partners including the team’s top blueliner, Carl Neill. While the team was certainly helped by goals from Anthony Gingras and Philippe Sanche to tie the game late in the second and the game winner by Jean-Philippe Beaulieu in the third, it was the team’s penalty kill that iced the win. The unit killed off several key penalties in the final frame, including a five minute penalty and game misconduct for forward Francis Brunelle. Fletcher was a key piece of the penalty kill against RMC. “It’s tiring, penalty after penalty. We weren’t getting any breaks. But we executed our systems perfectly, it felt good to be out there having an impact,” said the rookie forward. While Fletcher had provided some solid offensive chances in the second period when the Stingers outshot the Paladins 21-7, his aggressive defensive game was even more impressive. Breaking up plays, handing out heavy hits, and moving the puck strongly through the neutral zone, Fletcher impressed teammates who couldn’t help but talk about how strong of a night he was having. It was a good night for him to have such a performance, with his father in from Vancouver to see him play. He certainly didn’t disappoint. The Stingers have now won four of their last five games with just one to go heading into the winter break. That includes wins in each of their last three. Rookies like Fletcher and Roy really coming into their game is a big part of that recent success. “We’re a couple of rookies [on the team] so it was hard at the beginning to get used to the league and get used to playing with new guys. But in the last couple of games we managed it pretty well,” said Roy. It’s also been a matter of the team coming together as a whole, getting to know each other and gel more on and off the ice. 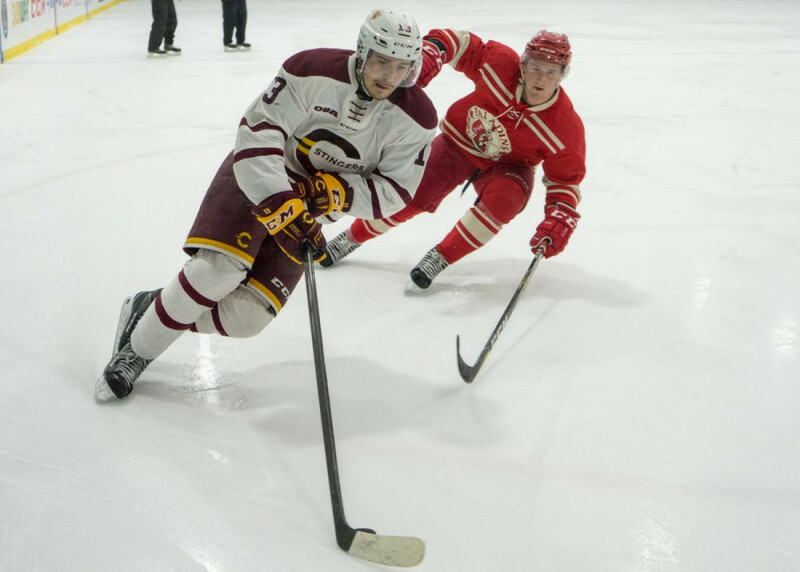 The Stingers’ one loss over the last five games, an 8-1 defeat against the division leading Ottawa Gee-Gees, was a difficult experience that made the team closer in the end, according to Fletcher. “After the the Ottawa weekend, everyone kind of regrouped. From there it’s been noticeable that everyone’s meshing well,” said Fletcher. The rookie says the team had a players night out to really come together as a group and get closer as teammates. The results have certainly been noticeable as the semester draws to a close. The Stingers have their final match before the break against the Nipissing Lakers this Saturday at 7:30 p.m.